Have you ever ben searching the web and landed on a site where you were intrigued to contact someone or something listed on that site? When you clicked on the email address provided to make contact ... were you initially prompted to to use Microsoft Outlook or a different legacy system? If you're a Gmail user, these instances can be frustrating. Today, we're going to discuss how to set up your Gmail as your default email application when clicking on hyperlinked email addresses. Right-click the Notifier icon in your system tray and select Options. 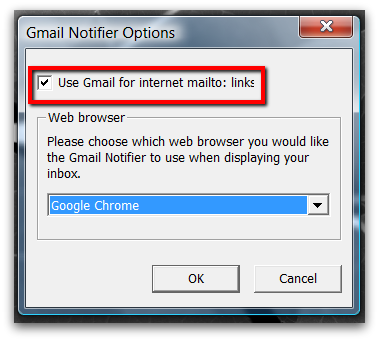 Check the box next to Use Gmail for Internet Mailbox: links. 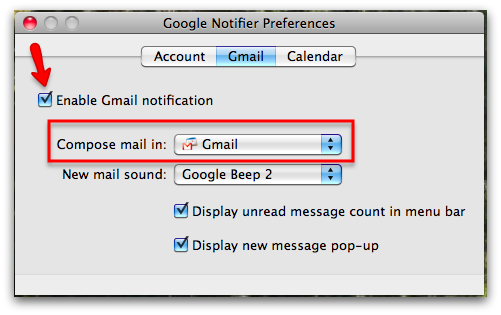 If you decide later that you do not want to use Gmail as your default email application, simply uncheck the box. Select the Gmail tab and choose Gmail as the program from the Compose mail in drop down menu. Will you be changing your default email application to Google Apps? Let us know in the comments section below.